The donation by Ray Peck of Juneau and Cy Peck, Jr., a former longtime Juneau resident who now lives in Hawaii, includes letters, papers, newspapers, newsletters and more than 200 color and black-and-white images collected by their father, the late Cyrus E. Peck, a former grand president of the Alaska Native Brotherhood (ANB) and grand secretary emeritus. Most of the pieces date from the 1940s to the 1970s and span a broad range of issues advanced by the ANB. Papers written by William L. Paul, Sr., include titles such as “Watergate, Wounded Knee and Other Wrongs” and “Cultures Influence the Present.” The collection also includes letters by Paul to Cyrus Peck and the ANB newspaper Voice of the Brotherhood, which was published by Peck. The set also includes writings by other Native rights activists, including Peck, Louis Paul, and Roy Peratrovich. Most of the photos were taken by Peck and five of them show images of William Paul and the late Tlingit spiritual leader Dr. Walter Soboleff, who is the namesake for SHI’s building. The collection is significant because it gives more insight into ANB history and includes photos we haven’t seen before, said SHI President Rosita Worl. It also offers a glimpse into the mind of William L. Paul, Sr., a formidable warrior who fought for Native people on the front line of many legal and political battles of his time, she said. SHI encourages families of people who fought for Native rights and other causes to donate their papers and other materials related to their activities to an archive for study. The Peck family was deeply involved in the ANB, said Worl, adding SHI is grateful the collection was kept intact and given to the William L. Paul, Sr., Archives. “I thought these materials were gone,” she said. The collection will be cared for at SHI’s new building, which includes a research facility and climate-controlled vault for the William L. Paul, Sr., Archives and other collections. The archives is open to the public on weekdays by appointment. SHI also sponsors a visiting scholars program to encourage researchers’ use of the archives and to promote study of Native history and culture. 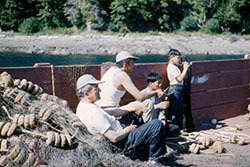 Caption: Photo by Cyrus E. Peck shows William L. Paul, Sr., Walter Soboleff, M. Quinto and Ray Peck on a seiner.